I have FOUR finished things to share today! I’ll go in order that they were finished. First up is a hat I made for my dad for Christmas. It was a quick, easy knit and only took one skein of yarn. He loves it! Notes:Easy pattern, came out great! I did change the top a little bit and did decreases every round when I thought I was getting close to running out of yarn. I think this helped keep it from not being quite so pointy. 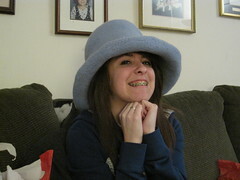 The second thing is a hat I made for my sister for Christmas. 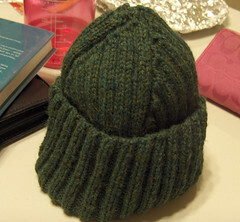 A felted hat. Notes: I had to felt part of it by hand because the washer wasn’t really doing the job and I didn’t want to keep feeding the machine quarters. It did NOT come out that great and was a disappointment. Should I ever make this pattern again, I will not make it as long as the pattern says. Didn’t turn out the way I expected at all and isn’t wearable. I’ll be making her a Harry Potter scarf to replace this. 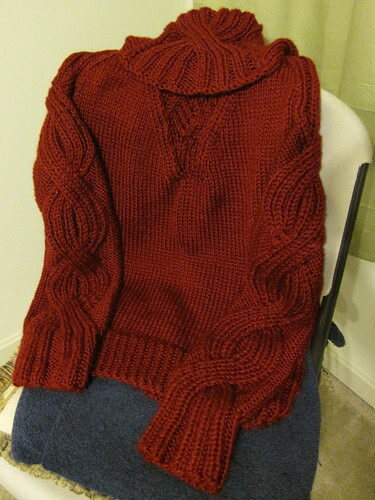 Next up is the Gable sweater. I have some hate for this sweater because of the pattern not really giving enough information/detail. I had to wing it once I got to the neck area, but I think I did a pretty decent job and I’m pretty happy with the end result. I still need buttons for it, but they are on the way from an Etsy seller: The Button Shop. Notes: I don’t even know where to start. The pattern was fine until you got to the neck/yoke area. I knit the large size. There was a lot of fiddling I had to do to keep it in pattern and not look ridiculous or decrease in the wrong places. I did try and get help through the Ravelry group without much luck and even contacted the designer through Ravelry but received no response. I don’t know what happened or if it was Vogue leaving something out or if the designer did. 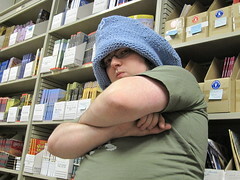 I had to fiddle with the hood edging a lot, too, and after knitting it 4 times, I think it came out pretty good. I have something like two pages worth of notes of what I did to fix it and make it look good without messing up the cable area. I have never been so happy to finish a project ever. I think I will get a fair amount of wear out of the sweater and I’m anxious to get the buttons on it so I can start wearing it out places. I’m going to send it in a trip in the washer to get rid of some of the excess dye that stained my needles quite a bit before I wear it or put the buttons on it. I do like the end result and it’s a very nice sweater. If I do decide to make this again, I’ll probably leave off the hood. 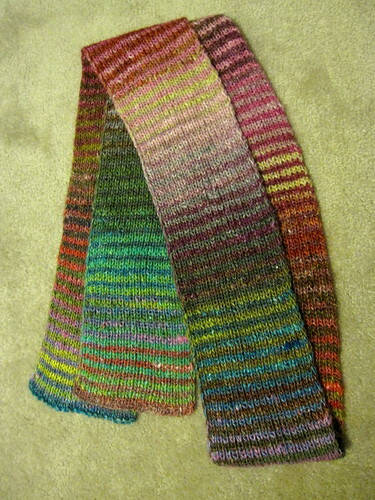 The last finished project I have for today is the Noro scarf I’ve been working on. I seriously love this scarf. Since it’s been done, I’ve been wearing it around the house for no real reason other than loving it! Notes: I absolutely love this scarf. LOVE LOVE LOVE. I don’t usually care for knitting scarves, but I couldn’t put this one down. I loved seeing the colors emerge and couldn’t wait to see what came next! I would totally make another one, without even thinking twice. I really don’t know if you can even pick two “bad” colors to go together. I wasn’t sure these colors would work, but the end result clearly says otherwise! It’s the last day of 2008, the ending of a great year that brought many, many good changes and things to my life along with some bumps in the road. I am expecting more great things to come in 2009 as I continue to grow and change in the best ways possible. I don’t do resolutions, but I do like to set a goal or two for myself for the upcoming year. I’m going to embark on the 365 project with some Plurk pals (Flickr pool) for next year. With the new camera Matt gave me, I’m hoping to get better at taking photos more often (and perhaps blogging more often because of it) and improving my photography knowledge and skills. We’ll see how it goes! Next time, I’ll tell you about Christmas and what I’m working on now that I’ve finished all these projects! Excellent finished projects! I especially love the Gable in the Simply Soft. 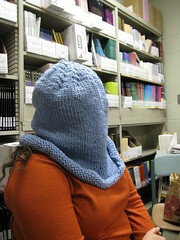 Now that I am past the “horrible” neck shaping, the rest of the hood should go fast for me. Beautiful stuff. Happy new year!